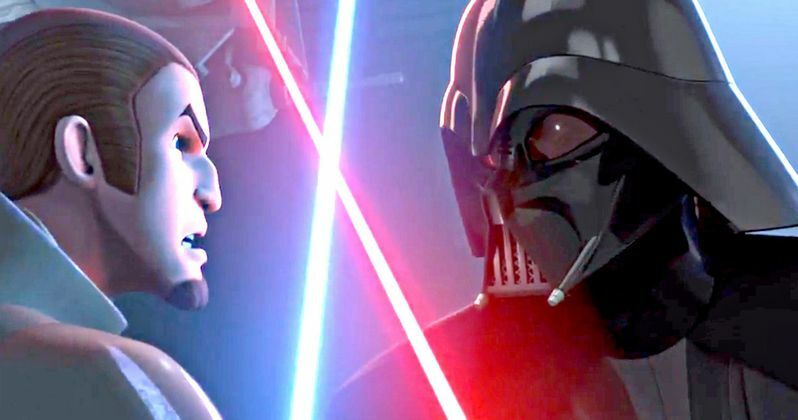 Star Wars Rebels Season 2 Trailer: Darth Vader Attacks! The Star Wars coverage keeps coming out of Anaheim, California as Celebration continues on throughout the weekend. Following the live panel for Star Wars Rebels, we now have the first trailer for all-new episodes. If you missed the epic streaming debut as it happened, don't worry! It's all here as Star Wars Rebels, the latest animated hit series from Lucasfilm and Disney, continues on into Season 2...And it gets crazy with a full on attack by iconic Sith villain Darth Vader and the return of former Clone Trooper Rex! This sneak peek teases what's to come in these all-new episodes of the Disney XD adventure, which picks up right where the shocking season one finale left off! Members of the cast and crew, including Dave Filoni (Executive Producer, Supervising Director), Freddie Prinze, Jr. (Kanan), Vanessa Marshall (Hera), Tiya Sircar (Sabine), Steve Blum (Zeb), Taylor Gray (Ezra) and other special guests were on hand to discuss the startling story developments revealed at the end of season one during the panel. And now we get to see some of that in this can't-miss exclusive preview of what's to come in season two!